The Great Outdoors RV Nature and Golf Resort includes over 2,800 acres, with much of this is left as a nature preserve.There are many lakes and ponds, some of which are stocked throughout the resort. We could walk to 3 within a few yards of our site. There is a two-mile nature trail beginning at the nature center where we were able to spot deer, quail, rabbits, an alligator (from a distance of about 25 feet) and a sandhill crane. We saw many other varieties of marsh birds. During our visit, we were impressed with the beautiful landscaping of each RV site. Our site was large with a level concrete pad and several landscaped islands and trees with the rest being thick green grass. The sites are a mixture of those rented to the public and those belonging to individual owners. Each site has full hookups including TV cable and a concrete pad. No tents or motorcycles are allowed. 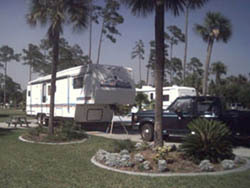 RV sites, RV Portes, Park Homes, Florida Villas and Resort Homes are available for purchase. The park is like a small city with over 1300 sites. At the front of the park are a restaurant, a general store with deli, a barber/beauty shop, a bank, an RV repair shop, a church, a golf cart shop, a post office, a hobby building, a huge clubhouse, and a golf pro shop. The recreation facilities available include 2 heated swimming pools, 2 whirlpools, an 18-hole golf course, 8 lighted shuffleboard courts, 3 horseshoe pits, 4 tennis courts(2 lighted), health club with sauna and steam room, and lake fishing. An exchange library is available. The only drawbacks of note we could find with the park were the lack of pull-throughs and the swimming pools not being open after dark. However with the wide paved streets and angled sites the lack of pull-throughs was not much of a concern. They try to leave as much green space as possible and pull-throughs would take up more space. The Great Outdoors is located at 135 Plantation Drive in Titusville, Florida. From the junction of I-95 exit 79 and SR 50, go west 1/2 mile on SR 50 to entrance road on the left. Phone (407) 269-5004 (800) 621-2267.